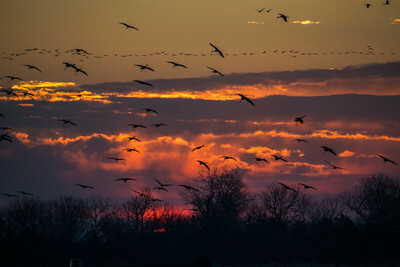 Photos from the biggest crane migration on earth in Nebraska. 800,000 or 80% of the world's Sandhills pass through this stretch along the Platte River from Kearney to Grand Island. One of the cooler events I have ever witnessed. 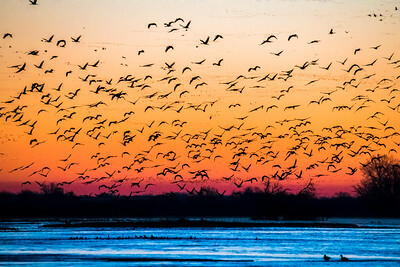 Thousands and thousands of Sandhill Cranes rise at sunrise on the Platte River in Kearney, Nebraska to head for the farms for a day of fattening up on corn before they come back to roost in the relative safety of the river at sunset. 800,000 cranes or 80% of the world's Sandhill Crane population passes through Nebraska. They stay 3-4 weeks gaining 19% body weight for their annual migration to northern Canada, Alaska and Siberia. In addition to the Sandhills, there are roughly 20 million other birds migrating and passing through as well. It's truly one of the more magical migrations on earth. It's really a sight to behold. The sounds are indescribable as wave after wave fly overhead. Many folks, especially at home here in Colorado whom I chat with, often describe Nebraska as a boring flyover state. A bit of haughtiness for sure. They can keep flying right over, but they are missing out on the splendor. I was born here. It's a place near and dear to my soul and has largely shaped me. The small towns, the true humility and salt of the earth people, the grand skies and horizons, the silence of the dark nights, the breadbasket of America, the cleanliness, the respect and connection with the earth and soil, Cornhusker football and the stunning bird annual migrations are just a few things that make this place truly special. Sandhill Cranes streak across the sky at dawn in their famous V formation as they head for the fields to eat corn all day. 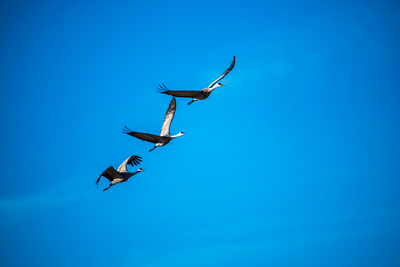 Sandhill Cranes and Snow Geese take to the skies. Usually the Snow Geese get out of the area quicker on their way north, but for a few weeks, the two birds share the same area. Sandhills coming in by the thousands at sunrise landing in the cornfields to begin eating and fattening up. Sandhills are truly graceful creatures. They are some of the oldest birds on earth dating back millions of years. Spiritually they are often recognized as a sign of strength, grace, perseverance and peace. 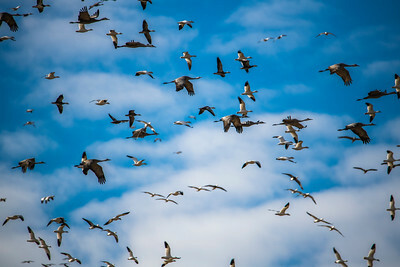 Thousands and thousands of snow geese take to the skies from roosting in a nearby pond. 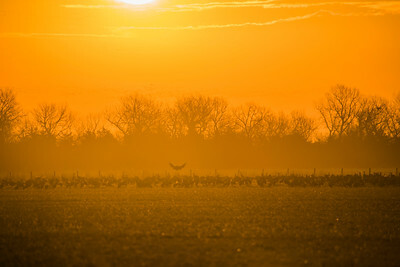 A Sandhill Crane streaks across the sky at sunrise seeking out a cornfield to go feed on for the day. Sandhill Cranes partner up with one mate for life. They remain partnered until one of them dies. You can often see them in the fields trying to impress mates by putting on elaborate dance moves trying to impress and entice. Sandhill Cranes find refuge in the middle of a sandbar in the shallow waters of the Platte River. They come here at sunset everyday after feeding for safety from predators. 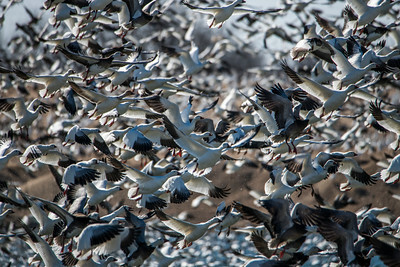 Snow Geese congregate by the thousands in a pond outside of Kearney, Nebraska. I think this one would make for a nice 1,000 piece puzzle :). A Sandhill Crane coming in to join the others at daybreak for a day of feeding in the fields. Sandhills can have over a 5 foot wingspan which makes for quite a dramatic effect. 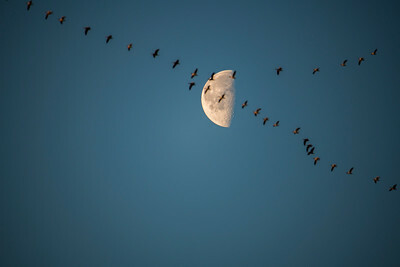 Sandhills streaking by the moon at dawn heading from the Platte River out to the fields. Cranes bask in the first sunlight of the day as they roost in the Platte River readying themselves for a day of feeding in nearby cornfields. Snow Geese take flight from a pond. It's astounding that these birds don't fly into one another more often.